The Kindle app for iPhone and iPad is an alternative to iBooks that allows users to enjoy books on the Amazon platform, as well as PDF documents and eBooks. With this application, users have instant access to over 900,000 books that can be purchased directly from within the application, thus avoiding annoying intermediate steps that only waste time. The application has a neat interface and offers the typical details that make reading from a device with LCD display: change text font, background color, display brightness or font size. Despite its simplicity, the latest update to the Kindle app for iOS has not come out very good. While the description of the Spanish App Store we can see that the 3.6.1 version fixes several bugs in the American claim that there is a fault with this update so they recommend not to upgrade. Obviously, this ruling affects the application regardless of the country from which the download. What happens if you update by mistake? Then all your library will be completely removed. Since Amazon is already aware of this bug, an update is expected in the coming days and hope that this time, the new version fix errors. Do not put the link to download the application to avoid disappointment. 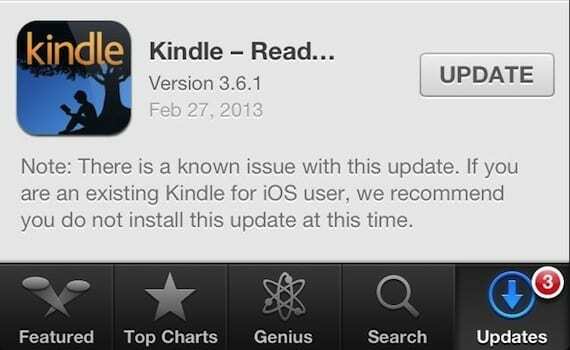 Article If you are using the Kindle app for iOS, do not update to version 3.6.1 has been originally published in News iPhone .